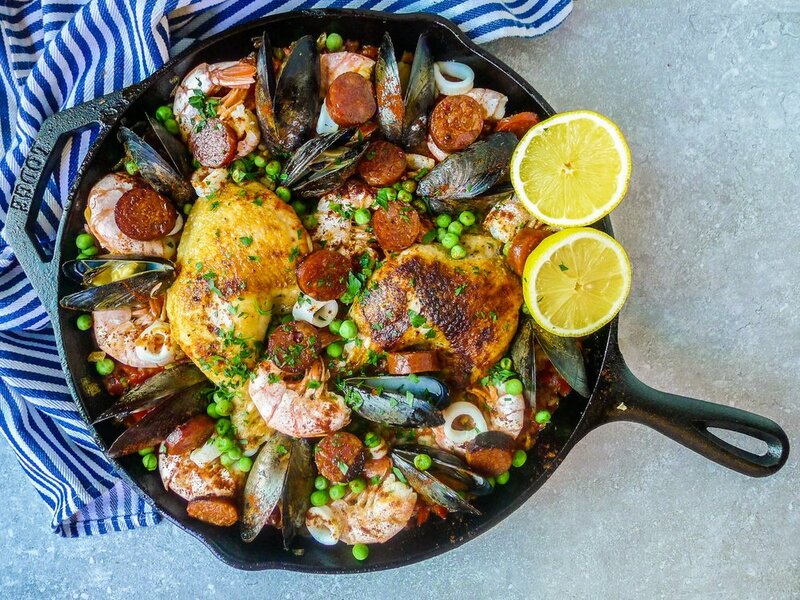 Ever since whipping up this paella for my 25th birthday dinner (yes, yes I did cook my own birthday dinner) I am ALWAYS looking for an occasion to pull out this recipe! It’s SO fun for a crowd because A) it looks gorgeous when you bring this colourful pan to the table, and B) it’s just SO DELICIOUS! Now the first time I made this dish was at Le Cordon Bleu during our semester of studying international cuisines (so yeah, wasn’t mad about this module - not to mention dessert was churros dipped in melted chocolate). We made this dish with fresh squid that needed cleaning and slicing, prawns that needed deveining and chicken legs that needed frenching (Le Cordon Bleu cuts NO corners when it comes to making a dish as delicious and beautiful as possible with ALL the freshest ingredients). Now as you can imagine, those tasks can be rather time consuming, I’ve made the same recipe using frozen squid rings, cleaned prawns and no “frenching” of the chicken legs because frankly who has time for that AM I RIGHT? This dish was just as delicious not to mention WAY quicker on the prep front! Now when you DO make this recipe (because trust me, IT’S WORTH IT) my best advice is get your Mise En Place in Order! Mise En Place - (directly translated to “Putting everything in place”) refers to the act of making sure all your ingredients are prepped and ready to go so that when you start cooking, there is no frantic chopping, measuring or defrosting. It aids in a smooth cooking experience and allows you to give your full focus to the to creating this beautiful dish! I hope you enjoy! Heat olive oil in a large cast iron skillet (or paella pan) over medium-high heat. Generously season chicken legs with sea salt and sear chicken in the pan skin side down until brown and crispy. Remove chicken legs and set aside. Allow oil to cool slightly, then quickly add the sliced chorizo. Once the oil has started to turn red, remove it from the pan (this is done to infuse the oil with the chorizo flavour) Note* work quickly as the chorizo can get burnt quite easily. Once you have removed the chorizo from the pan and set it aside, add the onion, season with salt and allow them to sweat. Next add the peppers and cook until soft then finish by adding the garlic. Once the garlic has become fragrant and started to brown slightly, add the wine and bring to a boil. Add the stock, tomatoes and saffron and bring to a simmer. Return the chicken legs to the pan and allow them to simmer in the stock (skin side up) for approximately 5-7 minutes. Set chicken aside. Gently sprinkle the rice across the pan, then return the chicken to the pan, carefully wedging/placing it onto the bed of cooking rice( this is the start of everything cooking all together). Allow it to simmer until rice is almost cooked through. Note* DO NOT STIR THE RICE. Once the rice is almost cooked, place the prawns on top of the rice. Sprinkle the smoked paprika and espelette pepper over the whole pan. Once prawns are lightly pink, add the mussels and cook until slightly opening. Next press the squid rings into the rice. Cover the pan with a lid and cook for 2 minutes. Remove the lid then add the peas and chorizo. Remove the pan from the heat, cover the pan and let it sit for 5 minutes before serving. Note* Discard any mussels that did not open. Top with chopped parsley and a squeeze of lemon and enjoy! P.S. Guys I am SO excited you are giving my recipe a try! Would LOVE to see how it turns out! Be sure to share you delicious doings on Instagram and tag me @dimsumdiet with all your creations!